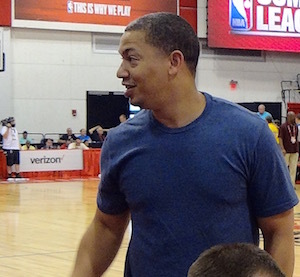 Here is an iFolloSports.com original photo of NBA champion Cleveland Cavaliers head coach Tyronn Lue from the 2016 Las Vegas NBA Summer League. Original video of the scene, which occurred at UNLV’s Cox Pavilion, is available via this link. Original video of Cavs GM David Griffin (gathered at UNLV’s Thomas & Mack Center) is found courtesy of this link.